The reflection of the boat and the passenger can be seen in the water as the Dusky Dolphin leisurely swims underwater before he surfaces off Kaikoura on the South Island of NZ. 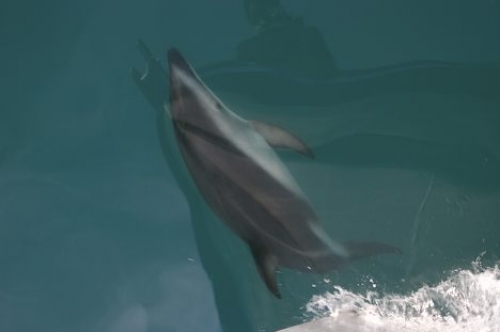 As a passenger aboard Encounter Kaikoura off the South Island of NZ takes a picture of a Dusky Dolphin underwater, the reflections of the boat and the passenger can be seen in the water. The sun glistens off the water's surface and makes this picture unique as it presents a mirror image of the boat and passenger. Dusky Dolphins are full of energy as they love to leap clear out of the water, frolic amongst the waves and/or surf alongside the wake of a boat. This Dusky Dolphin decided to catch a ride with Encounter Kaikoura off the South Island of NZ and is clearly visible underwater before he surfaces for air. These dolphins are known to be the most energetic of their species as they are always seen leaping about. Dusky Dolphins are a common sight off Kaikoura, NZ as they hang around the region throughout the year. Their locations of where they can be found may differ in the seasons as during the summer, they love to reside closer to the inshore waters and in the winter they prefer to be offshore further. Another incredible mammal that is regularly seen off Kaikoura is the Sperm Whale. They are immensely bigger than a Dusky Dolphin but they are not nearly as lively and acrobatic. When you board a dolphin watching tour with Encounter Kaikoura in NZ, you never know what type of day that the underwater mammals have planned. Each trip varies as these animals are wild and depending on the weather out on the water and where the dolphins are found, passengers can swim or snorkel with a Dusky Dolphin or two. Encounter Kaikoura is a highly reputable company that has spent many hours with the Dusky Dolphins off the South Island of NZ and pictures like this can be tricky to get due to the fact that they are very fast animals. Calm waters, glistening sun and a dolphin directly in front of the boat is more than one can ask for when on a dolphin watching tour - but this is just the beginning.